To ensure better user experience, HD601 adopts the latest Bluetooth 4.2 technology to maximize device compatibility, stability and pairing speed. NFC technology makes complex set-up process a thing of the past. Simply touch selected NFC-enabled devices to the on-body NFC-mark for a quick, seamless connection. Perfect for commuting and those moments when you want to enjoy your music all day. You can enjoy up to 20 hours of music playback when it's fully charged. The 40mm dynamic drivers and aptX-LL tech enhance sound quality, and minimize audio delay providing a live concert feeling and lag-free audio experience. Equipped with a noise cancelling microphone for crisp, clear phone call quality, the headset allows you to adjust the volume, change the track, pause and play. The soft earpads and the easily adjustable headband are made of skin-friendly simulated leather, filled with super soft foam, providing long-lasting comfort. Streaming wireless audio with Qualcomm aptX low latency ensures your devices deliver sound in sync with visual media. You can enjoy the freedom and maximum enjoyment while watching videos and playing games. It's free and easy to switch between balanced sound and extra bass sound by pressing twice on the power button. You can switch the mode according to your mood and the songs you play. You can connect it with all Bluetooth enabled devices in seconds, or use NFC feature for one-tap connection. 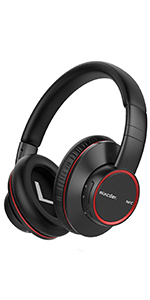 After initial pairing headphones auto-reconnect to any device, easily and instantly. Up to 20 hours of music playing time, only 1.5 hours of charging time. You can take it with you for any long journey. It supports wireless and wired modes. The package includes a 3.5mm audio cable. The soft earpads and the easily adjustable headband are made ofskin-friendly leather material, providing a customized and fatigue-free fit even for long time wear. More stable and faster stereo sound transmission with advanced Bluetooth V4.2. An optional wired audio mode provides maximum performance and versatility. 7. Are these able to connect to my phone and switch between music and a call? Yes, you can switch easily between songs and calls with the headphone in wireless mode; and the music will continue to play automatically as soon as the call is ended. 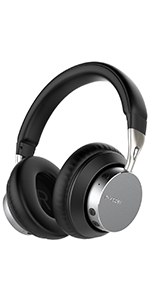 #Head-Fi#A Bassy BT Headphone Worth A Look.